Your pet's liver is an important organ. it's main function is to help digestion and conversion of nutrients, removing toxic substances from the blood, and the storage of vitamins and minerals. Due to this function, your cat or dog's liver is highly susceptible to damage. When it is over worked, it can become inflamed and can result in damage and loss of function. Fortunately, liver disease is a condition that can be well managed, and progression can be limited with proper nutrition and liver support. What can lead to liver disease in pets? There are four main factors that increase the likelihood of your pet developing liver disease: age (more common in geriatrics), breed, obesity, medications and chemicals that they may come in contact with. 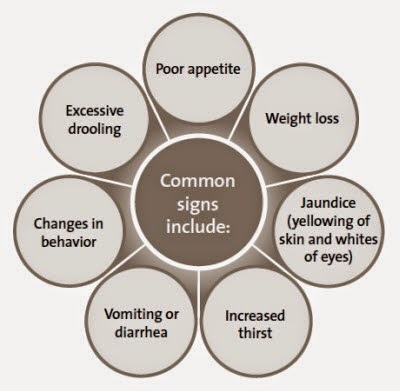 Other possible signs of liver disorders include dark-colored urine, pale gums, or a build- up of fluid in the abdomen that could be mistaken for sudden weight gain. What can help your cat or dog with liver disease? It is important to help your pet rest their liver and minimizing those functions that have to do with metabolism of fats, proteins, carbohydrates and drugs. A first step would be to transition your pet to a raw or canned low-fat, grain-free diet, adding plenty of green vegetables, carrots and even a small amount of beets. The second step should be adding supplements that support the liver function. Askariel.com has the Pancreatitis & Liver Support Kit, that contains three formulas with powerful enzymes and nutrients that are highly effective in breaking down food, easing the burden on the pancreas, liver and digestive tract. Herbs in the Liver/Gallbladder formula reduce elevated liver enzymes help flush toxins from the liver and gallbladder. With the addition of Oxicell, your pet will have the benefits of critical antioxidants delivered into the body to help fight free radical damage and inflammation. It also has been shown to reduce elevated liver enzyme levels.